The Cornwall-based charity Surfers Against Sewage has teamed up with advertising agency M&C Saatchi and th tattoo artist Nick the Tailor to create a range of body art designs with a difference. 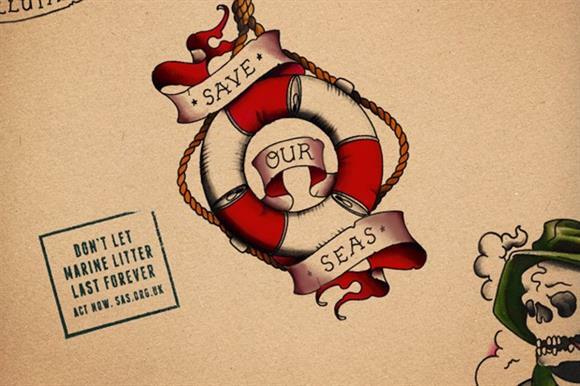 The designs, which have been posted on the charity’s Instagram, Facebook and Twitter feeds, mimic the style of traditional maritime tattoos but carry modern environmental messages such as "save our seas" and "don’t let marine litter last forever". They also highlight the most common types of litter found on the UK's beaches. For example, on closer inspection the lighthouse in one of the tattoos is actually a plastic water bottle, and the sails on a pirate ship are plastic carrier bags. 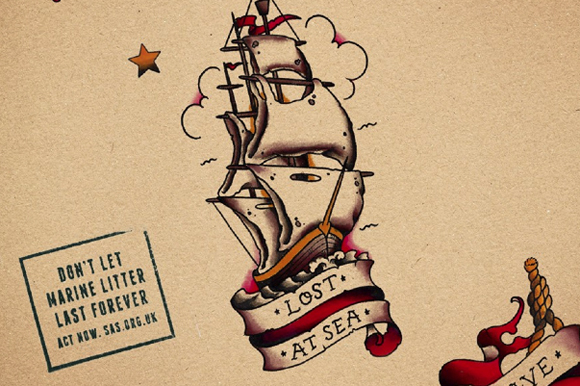 Hugo Tagholm, the chief executive of Surfers Against Sewage, says that "incorporating the commonest items of marine litter into the tattoos reflects the growing permanence of marine litter on UK beaches and across the globe, and the need for communities, governments and industry to take collective action to protect our precious coastlines". The artwork has been featured on t-shirts and other promotional materials, and is available as real tattoos (albeit temporary ones). There is a video showing how the designs were created on the charity’s website. Surfers Against Sewage recently published its Marine Litter Report, which set out a vision to reduce UK beach litter by 50 per cent before 2020. The charity says that the litter recorded on UK beaches in 2014 was at its highest level ever, with 2,457 pieces found for every kilometre of coastline surveyed. It says this results in a clean-up cost of £18m a year for local authorities. Has it been covered in the media? The campaign is being backed by high-profile figures from the world of surfing, including the 11-time European longboard champion Ben Skinner and the professional surfer Corinne Evans, who have both been photographed with the tattoos for the charity’s website. It has also been featured in the Daily Mirror as well as local press and on various surfing websites. Tagholm says the campaign "aims to shine a spotlight on the marine litter crisis and create a rallying call to the nation to take more action to protect our waves, oceans, wildlife and beaches from marine litter". The charity wants to alert communities to its Big Spring Beach Clean this weekend, in which more than 5,000 community volunteers will help to clean up 175 beaches. This is a striking campaign that will appeal to the charity’s young, coastal target audience. The images get a strong environmental message across while still being fun and visually appealing, and seem to have been well recieved on social media, where the small charity has an impressive following.